President Moon Jae-in was invited to speak at the Körber Foundation(Stiftung) in Berlin, where he announced “Berlin” peace initiatives for the Korean Peninsula. North Korea carried out its sixth nuclear test at the Punggyeri nuclear test site, creating a temporary geopolitical crisis on the Korean Peninsula. President Moon Jae-in attended the UN General Assembly in New York. In his keynote speech at the event, Moon announced “PyeongChang Peace Initiatives” under which the South planned to draw North Korea’s participation in the 2018 PyeongChang Winter Olympics to turn it into an Olympics of Peace and build a momentum for the resolution of the North Korean nuclear issue. During his address at the National Assembly, President Moon Jae-in unveiled five principles for achieving peace on the Korean Peninsula. North Korean leader Kim Jong-un indicated in his New Year’s speech the possibility of sending North Korean delegates and athletes to the Winter Olympics in the South. Unification Minister Cho Myoung-gyon and Ri Son-gwon, chairman of the North Korean Committee for the Peaceful Reunification of the Fatherland, sat down with each other for high-level inter-Korean talks at the Peace House of Panmunjeom. A North Korean high-level delegation, including North Korean leader Kim Jong-un’s sister and deputy director of the Central Committee of the ruling Workers’ Party, Kim Yo-jong, and the head of the Presidium of the Supreme People’s Assembly of the North, Kim Yong-nam, attended the opening ceremony of the PyeongChang Winter Olympics. President Moon Jae-in invited the high-ranking North Korean delegation to a luncheon meeting at the presidential office. Kim Yo-jong delivered North Korean leader Kim Jong-un’s letter to President Moon. A five-member South Korean delegation, including National Security Adviser Chung Eui-yong and National Intelligence Service Director Suh Hoon, visited North Korea and met with North Korean leader Kim Jong-un. 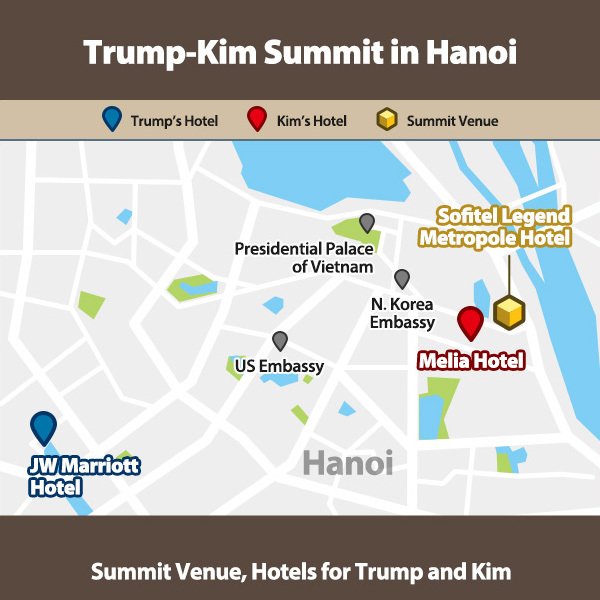 The South Korean delegation returned to the South and held a media briefing at the presidential office, where they announced an agreement to hold the 2018 Inter-Korean Summit in late April. U.S. President Donald Trump accepted North Korean leader Kim Jong-un’s proposal they meet with each other. The government launched the preparation committee for the inter-Korean summit. Unification Minister Cho Myoung-gyon and Ri Son-gwon, chairman of the North Korean Committee for the Peaceful Reunification of the Fatherland, held working-level inter-Korean talks at the Tongilgak building on the northern side of Panmunjeom. They adopted a three-point joint press statement, confirming the plan to hold an inter-Korean summit on April 27th. North Korean leader Kim Jong-un and his wife Ri Sol-ju watched a performance by the South Korean art troupe on April first. During the third Plenary Meeting of the Seventh Central Committee of the ruling Workers’ Party presided over by North Korean leader Kim Jong-un in Pyongyang on April 20th, North Korea declared to end the simultaneous pursuit of nuclear weapons and economic growth and instead pursue economic growth and peace. 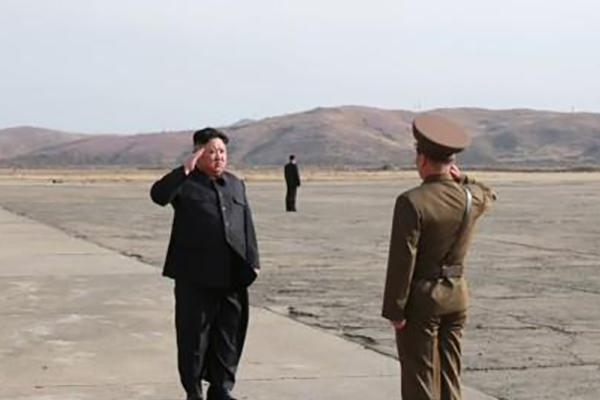 The North also said it will discontinue nuclear and missile tests and close down its main nuclear testing facility in Punggye-ri in Kilju County in North Hamgyong Province. 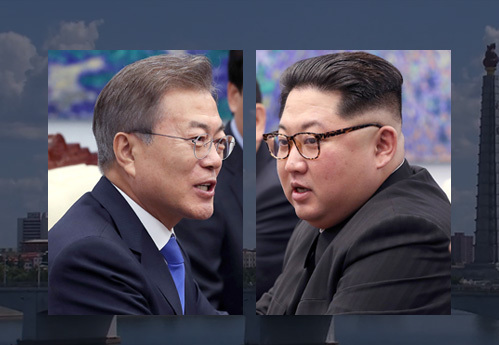 The top leaders of the two Koreas are set to meet one another during the 2018 Inter-Korean Summit at Panmunjeom. "Pyongyang will reconsider the North Korea-U.S. summit if it comes under pressure to unilaterally abandon its nuclear program"
"North Korea could make the U.S. suffer a terrible tragedy that it has never experienced or imagined before"
"North Korea is willing to talk with the U.S. to resolve issues any time and in any format"
South Korea's President Moon Jae-in and North Korean leader Kim Jong-un held summits in Pyongyang from September 18th to the 20th. 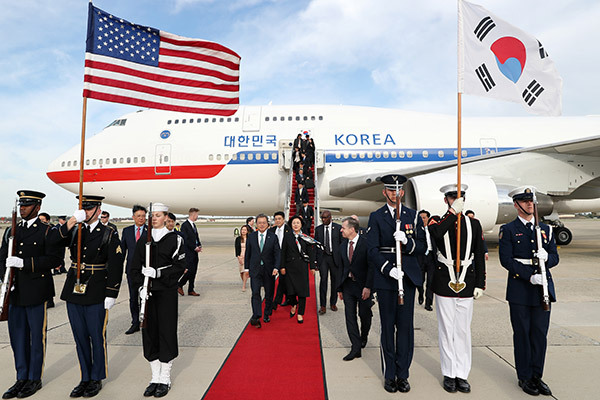 The two leaders assessed that remarkable achievements had been made since the historic Panmunjeom Declaration was signed, including the two Koreas engaging in close government-level dialogue and communication as well as in nongovernmental exchanges and cooperation in various areas, and taking significant steps toward easing military tensions. The two leaders reaffirmed the principles of self-reliance and self-determination of the Korean people and agreed to consistently and continuously advance inter-Korean ties for reconciliation, cooperation, peace and joint prosperity. They also agreed to exert joint efforts to realize, through policies, the people's aim and hope for improved inter-Korean ties to lead to unification. The two leaders sincerely and extensively discussed issues on further boosting inter-Korean ties to a higher level through the thorough implementation of the Panmunjeom Declaration. They also shared the view that the Pyongyang summits will become a major turning point in history. 1. The two Koreas agreed to end hostility at fortified regions, including the Demilitarized Zone, and continue such momentum by seeking to remove all real risks of war on the Korean Peninsula and resolve hostile relations. ① The two Koreas agreed to adopt a military accord on implementing the Panmunjeom Declaration as a side agreement of the Pyongyang Declaration, and to thoroughly observe and execute the accord. They also agreed to take substantial steps to make the Korean Peninsula a permanent peace zone. ② The two Koreas agreed to swiftly operate a joint military committee to inspect the status of the implementation of the military accord. They also agreed to engage in close communication and consultation at all times to prevent armed clashes of accidental nature. 2. The two Koreas agreed to further boost exchanges and cooperation based on mutual reciprocity and co-prosperity as well as devise substantial ways to advance national economy in a balanced manner. ① The two Koreas agreed to hold within this year ground-breaking ceremonies for connecting the Gyeongui and Yellow Sea railways and roads. ② The two Koreas agreed to normalize operations of the Gaeseong Industrial Complex and tours to Mount Geumgang once necessary conditions are met as well as to discuss the issue of creating a joint special economic zone along the Yellow Sea and a special tourism zone along the East Sea. ③ In a bid to conserve and restore the natural ecosystem, the two Koreas agreed to actively pursue cooperation on environmental issues, starting with producing results in cooperation on forestry currently under way. ④ The two Koreas agreed to boost cooperation in health and medicine, including emergency steps on preventing infectious diseases from entering or spreading on the peninsula. 3. The two Koreas agreed to further strengthen humanitarian cooperation to fundamentally resolve the issue of separated families. ① The two Koreas agreed to open a permanent reception venue for separated families in the Mount Geumgang region at the earliest date possible and to that end, agreed to swiftly repair the reception house at the mountain resort. ② The two Koreas agreed to first work out through Red Cross talks the issue of holding video reunions and of allowing families to exchange video messages. 4. The two Koreas agreed to actively pursue cooperation and exchanges in a wide array of areas to promote the mood of reconciliation and unity as well as to boast the unyielding spirit of the Korean people both inside and outside of their countries. ① The two Koreas agreed to further boost exchanges in culture and arts, starting with a performance in Seoul in October by a Pyongyang art troupe. ② The two Koreas agreed to jointly take part in international competitions, including the 2020 Summer Olympics, and to seek to jointly host the 2032 Summer Olympics. ③ The two Koreas agreed to hold ceremonies to mark the eleventh anniversary of the October 4th joint declaration and to jointly commemorate the 100th anniversary of the March 1st independence movement. To this end, they agreed to hold working-level consultations. 5. The two Koreas agreed that the Korean Peninsula must become a place of peace that is free of nuclear weapons and nuclear threats and for that aim, the two Koreas shared the view that they must swiftly make necessary headway. ① North Korea agreed to permanently dismantle its missile engine test facility and missile launch tower in Dongchang-ri in the presence of experts from related countries. ② North Korea expressed intent to take further steps, including permanently dismantling the Yongbyon nuclear facility, if the United States takes corresponding steps in line with the spirit of the June 12th joint statement. ③ The two Koreas agreed to engage in close cooperation in the process of pursuing the complete denuclearization of the Korean Peninsula. 6. North Korean leader Kim Jong-un plans to visit Seoul at an early date at the invitation of President Moon Jae-in.